Do you keep a diary? Do you write down major events that have occurred in your life? Have you ever thought about putting them all together into a book? One former Osage resident, Bonnie Warrington, has done just that. 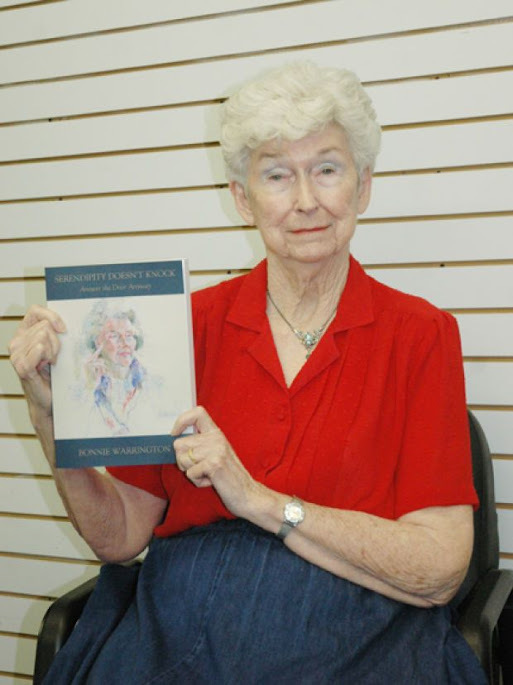 On Sunday, June 30, from 2-4 p.m., Warrington will be holding a book signing at the Mitchell County Historical Society for her self-published autobiography, "Serendipity Doesn't Knock...Answer the Door Anyway." Warrington will begin her open house with a special presentation beginning at 2 p.m. The autobiography features many stories about events and adventures she encountered "during a lifetime of changes." "The title of my book describes those unexpected discoveries of surprise," said Warrington. "This is my first and perhaps only book, since it includes over 70 years of saved and treasured memories." Warrington, a former Osage resident, met her husband Harold "Hal" Warrington in 1949 during their freshman year at LutherCollege. Her husband was born in Osage and raised on his family's farm south of town. The farm was located across the river from the country club. "Hal and I used to fish for golf balls in the Cedar River," she said. He enlisted into the U.S. Navy in 1950 during the Korean War. Because he was stationed in Maryland, Warrington left Luther, enlisted in the U.S. Civil Service and went to Washington. The couple was married in 1952 and had their son, David, in 1954. After serving his four-year enlistment, the couple came back to Iowa. "Hal's father made arrangements for us to rent a farm at NoraSprings," she said. "We stayed there nine years. "Then we moved to Phoenix, Arizona, where Hal went to work for General Electric (GE) as a computer programmer, a very remarkable story in itself." She lived in South Africa for nine months while her husband did field test operations for GE. They also spent several months in Belgium. In 1976, while living in Belgium, she took a 30-day bus tour of Eastern Europe. The topics of Warrington's book include work experiences and sightseeing in Washington, D.C. in 1953; a time of editing the weekly newspaper in NoraSprings called "The Nora Springs Advertiser," working as a travel agent in Roanoke, Virginia, and serving as the director of education in a LutheranChurch in Phoenix. "My favorite job was working for American West Airlines, because it allowed us to fly at no cost," said Warrington. She pursued a goal of earning a degree in Art Education, graduating from RadfordCollege in Virginia after attending three other colleges, as she and her husband moved around the country. "My book includes colored illustrations of my paintings," she said. Warrington said she had never considered writing a book until she moved to Osage in 2004, to be close to her sister in Decorah as well as Hal's sister, Lucy Gunsallus. Within a month, she had joined the Alpha Writers Group and became motivated to write essays, poems and short memoirs. Later, she enrolled in a memoir-writing workshop in St. Ansgar taught by Gail Kittleson. "Suddenly, my short stories became organized and put into book form." The MitchellCountyHistoricalMuseum is located inside the Cedar River Complex, 809 Sawyer Drive, Osage. The museum is open daily from 1-5 p.m.